The months have flown by since we got the 4 Tamworths at the end of February, the 2 “eaters” were sent off on schedule in August and the 2 “keepers” (Sissy and Esther) have done well since then. However the intervening time hasn’t been wasted as I’ve read up on pig breeding and making plans for farrowing early next year which could be outside or inside depending on the weather. 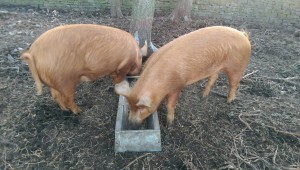 The main focus has been on AI because with only 2 gilts here at the moment it’s just not worth having our own boar. I eventually decided to use AI for one pig but could still choose to send the other one off to visit a boar. There is an element of concern when mixing with other pigs as that creates an opportunity for passing diseases but if correctly managed that the risks should be fairly low. After checking the back ends of our pigs on a regular basis – probably far more often than is healthy – it looks like I have timed everything correctly. This morning had been noted in the calendar as the day to place the order for fresh AI and after a quick final check earlier this has now been done. The next day delivery service is impressive but also crucial given that the whole event is particularly time sensitive.